I can't emphasize enough for you to buy from a reputable breeder. Two birds from my first three pairs that I purchased from someone who I thought was a reputable breeder (turned out to be a bird broker), lost their equilibrium, twisted their heads sideways or upside down and were unable to perch normally. They went around in circles vainly attempting to regain their equilibrium. They fell off their perches and could only keep their balance on a flat surface. When I phoned the breeder (bird broker) to ask about this problem, he said that he had no idea what I was talking about. "The birds must have been startled and hit their heads and were now brain damaged." The first bird died within two weeks, the second is still with me. He eats, molts and exists, but only on the bottom of his cage. Since that first experience I have read an article written by Robert Black, identifying the problem to be a recessive genetic characteristic that is reinforced by breeding in very limited strains. He states that in ideal nutritional conditions, with an abundance of trace minerals in the diet, this deformity may not surface visually. However, when these trace minerals are in short supply, the nerves and muscles go into spasms and contractions. This is why most Gouldian breeders, they deny knowing of the existence of twirling because they don't want anyone to know that they have this genetic predisposition in their lines. Last February I had a lady write to me telling me of her experience with a twirler and the solution that she received from her vet. I have since tried it myself on a 4 year old bird that I had purchased 3 years ago. He had just started twirling two weeks before her letter. The solution works! Her vet said that the physical expression of the nutritional deficiency was a blown inner ear. That is why the birds loose their equilibrium and can't perch properly. My vet said that he sees it all the time in dogs, cats and even once in a horse. A two week course of treatment with SMZ Liquid or Trimethoprim Sulfa It took approximately three more weeks after I stopped the SMZ Liquid, but it healed the inner ear completely, and now my little friend is perching again and shows no signs of the twirling effect. I have not tried the treatment on my bird that has been twirling for 4 years, because my vet said that the inner ear has healed, but probably not completely closed, and therefore his equilibrium will always be off. The antibiotic in most cases should allow the inner ear to heal closed. However, you must remember, this is only a cure for the blown inner ear. These birds still have the genetic predisposition for a higher than normal requirement for vitamins, trace minerals etc., and if they fall in short supply again, the twirling effect will return. The treatment with SMZ Liquid is only the solution that will allow your bird to live out it's life peacefully. My upmost suggestion is that you NEVER breed these birds again. 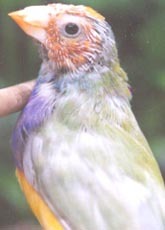 In order to control this genetic trait and eradicate it from the Gouldian, you need to keep accurate records. When a bird shows this problem, stop breeding the pair immediately. An article written by Don Thorschmidt suggested a drug called Nystatin seems to cure twirling. The Nystatin suspension is still used as a human drug in treatment for fungal or yeast infections, so it will be necessary to obtain it from your vet or with a written prescription. There is a similar drug call Medistatin that can also be used for yeast infections in caged birds and pigeons. 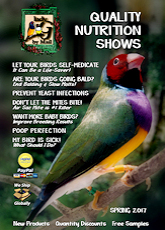 I tried the Nystatin treatment, with no success, on a friend�s bird when it first started to show signs of twirling. But if there is no fungal infection present, Nystatin or Medistatin will not help the twirling behavior. 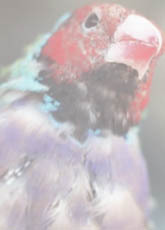 An article in the April 2003 edition of Pet Age magazine, Louise Bauck, BSc, D.V.M., MVSc, the director of veterinary services for the Hagen Avicultural Research Institute in Montreal writes, �Avian paramyxovirus type 111 virus causes twirling (circling) in a variety of finches. It is difficult to diagnose even in a deceased bird, but has been associated with inflammation of the pancreas at necropsy. There is no treatment for avian paramyxoirus type111. Some affected birds survive, but many always tend to circle or tilt their heads. To prevent problems, avoid stressing the birds." I have heard over the years that Stargazing was a precursor to Twirling. I do not believe this to be the case. When a Gouldian Stargazes, it will repeatedly throw it's head up in the air as though looking at the ceiling. This behavior usually begins when a bird has been moved from a flight situation or a large cage, into a much smaller enclosure. I believe that it is a neurotic behavior because the bird feels too closely confined. I have found that if you place the bird back in it's original flight or cage, the behavior stops. Because the exact cause of the Twirling is still unknown, bacterial or fungal infections, vitamin E deficiency, head trauma, tumors and genetics just to name a few, the treatments have also been random at best. Antibiotics, anti-fungal, and the list goes on. I have met and spoken to Robert Black personally since I discovered the SMZ treatment for the twirling effect and he concurs that the blown inner ear (vestibular organ) is the probable cause. We both cannot stress emphatically enough that proper nutrition, ALWAYS, should be what we all strive for. Our birds must receive much more than seeds as a diet. 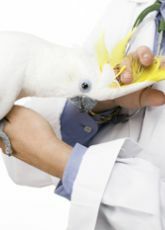 This does not mean that we can attribute all cases to the same pathogen or cure with the same treatment, but it does mean that stress and a poor diet could easily be a contributing factor when you have a bird with a genetic predisposition for a higher than normal requirement for vitamins, trace minerals etc. Please see the section on diet for my recommendations.